The ULI Technical Assistance Panel (TAP) is a high-profile industry program that brings together the finest expertise in the real estate, planning and development fields to collaborate on complex land use and redevelopment projects. Weston TAP 2.0 was organized by ULI Toronto with the aim of exploring the evolution and potential of the Weston neighbourhood and developing a vision for its retail environment. 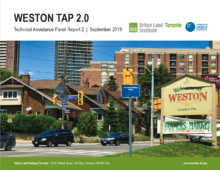 The panel was to follow-up and build on the findings from the original 2011 Weston TAP.